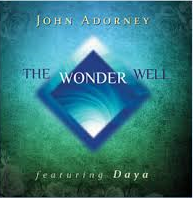 One of John Adorney's gifts is his ability to set a vibrant bass sequence that entices and comforts the listener, while lacing beautifully orchestrated layers above. Whether with vocals or instrumentals, the combinations and intricacies of these top notes, transports the listener in a direction that leaves them feeling a sense of freedom and wonder, hence aptly named, “The Wonder Well”. The strength of his classical background is let loose in this New Age genre, which is grounding, yet invokes a sense of momentum. Add to this, the depth of feeling, and sheer richness, of the unadulterated quality and tone of Daya, and you have created a timeless artwork.